I really should call it folding, it is different to wrapping the dumplings . :)) — Place the filling in the middle, and fold up the three ‘corners’. 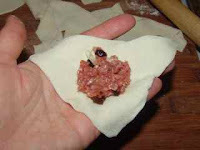 The filling of each wonton is not supposed to be too full, otherwise it is going to be difficult to ‘close’. So, it is not only the wonton that will fill up your stomach, but also the soup — nice soup base is very important. 1) Take one wonton pastry sheet, and place it on the palm with one corner facing you. 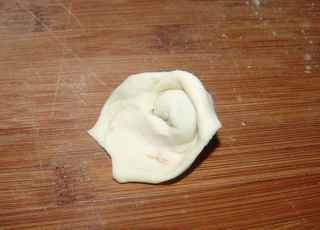 3) Fold up the corner which was facing you, ‘ceil’ well the filling. 4) Use both hands to hold the other two corners, overlap them underneath the ‘filling’. 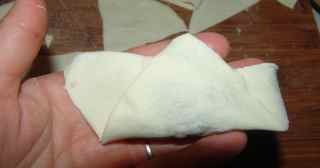 Again, before you place the prepared wonton on the plate or, like me, on the bamboo board, dust enough plain flour to prevent the stickiness. 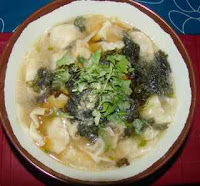 In Northern Chinese cuisine, the wonton soup is normally clear soup, often with some dried seaweed in (zi cai). 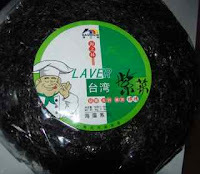 It is different to those dark green ‘thicker’ sea leaves (normally we use in the salad dish), this seaweed is lighter, very thin. Long time ago, with my good friend Zhenya, we saw somewhere it was called ‘black mess’ — we really laughed hard. But this seaweed is different to the ones used in Japanese or Korean cuisine. In Northeast cuisine, they are in original formal (not toasted), sold dried in ‘block’, and normally in dark purple colour (sometimes dark green colour), so it is also called ‘Zicai’ as ‘purple food’. In the North of China, it is cooked in the soup, to which it gives a fresh ‘sea’ touch. :) But in this recipe, it is optional. 1) In a heated wok, pour in 3-4 tablespoons of oil, (I made for 2 people, with some leftovers). 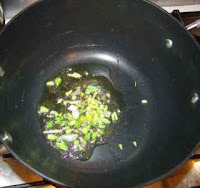 2) When the oil is heated, add the chopped spring onion in, and 1/2 teaspoon of ground sichuan peppercorn. 3) When the spring onion is well cooked (the smell fully comes out), pour in 3-4 big bowls of water. 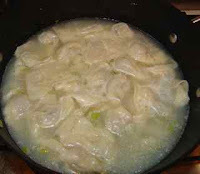 4) When the water is boiling, put prepared wonton in the wok, and bring the water to boil again. 5) Meanwhile, add 1 tablespoon of salt, 2 tablespoon of light soy sauce. 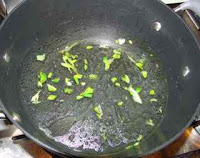 6) When the body of the wonton is popping and floating to the surface, tear some dried seaweed into the soup. (Don’t leave the seaweed too long in the boiling soup, otherwise it will ‘disappear’ in the soup — it can be cooked very quickly). Turn off the fire, add in drops sesame oil (optional), and take the wonton with plenty soup into a soup bowl. 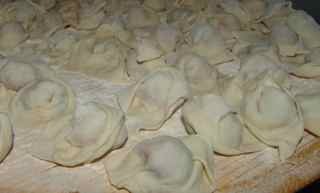 >Wontons always look so difficult to make but you made it look so easy. Thanks for sharing the photos and recipe.